BLACKstreet was founded in 1994 by producer/songwriter Teddy Riley and Chauncey "Black" Hannibal, with Joe Stonestreet and Levi Little as additional members. 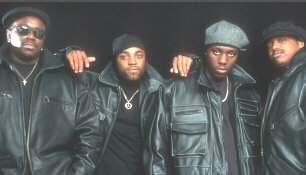 They first appeared together as BLACKstreet with two songs on the movie soundtrack to "CB4." Joe Stonestreet sang lead vocals on the first BLACKstreet single "Baby Be Mine," but left the group before finishing their debut album. He was replaced by Dave Hollister - and so BLACKstreet was completed to release its self titled debut in 1994. "BLACKstreet" included the hit singles "Booti Call," "Before I Let You Go," "Joy" (co-written by none other than Michael Jackson), and "U Blow My Mind" and went platinum for more than 1 million sold records. Dave Hollister subsequently left for a solo career and Levi Little exited as well; their replacements were Mark Middleton and Eric Williams. "Another Level" was released in 1996. With new members Mark Middleton and Eric Williams (who Teddy already wanted for the first line-up) BLACKstreet really took their music to another level by moving from hip-hop beats dominated tracks to pure R&B. The first single "No Diggity," which featured Dr. Dre and Queen Pen, exploded. It went #1 in several countries and has been certified platinum. BLACKstreet won a Grammy for "No Diggity." But "No Diggity" wasn't the only hit single on "Another Level." The album also had singles like "Fix," "Don't Leave" and "Can't Get You (Out Of My Mind)" to make the album sell more than 4 million copies and become certified multi-platinum. With the release of "Finally" in 1999 the group had yet another change in the line-up. Mark Middleton left the group to start a solo career. He was replaced by Terrell Philips. Middleton and Williams returned to restore the "Another Level" lineup, and Riley's solo project became a BLACKstreet reunion. The resulting album, "Level II," was released in early 2003. 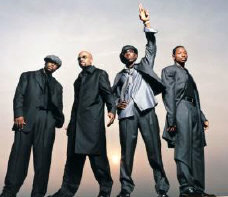 BLACKstreet, featuring Teddy Riley, may be available for your next special event! booking entertainment, such as major name entertainers or celebrities, booking BLACKstreet, booking information on BLACKstreet, or hiring BLACKstreet for your special event, or to book or hire BLACKstreet, or if you are seeking the BLACKstreet booking agent for corporate entertainment or for a private party. Consider the opportunity to book BLACKstreet or other entertainers for a wedding, birthday, anniversary, business meeting or convention. If you are not a talent buyer, we are unable to provide BLACKstreet manager or management contact information. Consider this your official BLACKstreet booking agency web site – The booking agent who works for you! This company acts as an entertainment consultant or broker/producer and does not claim or represent itself as the exclusive agent, representative or management of BLACKstreet. BLACKstreet, r&b music artists - booking agent. This group may be available for your event. Book them if you can. You will have the time of your life!